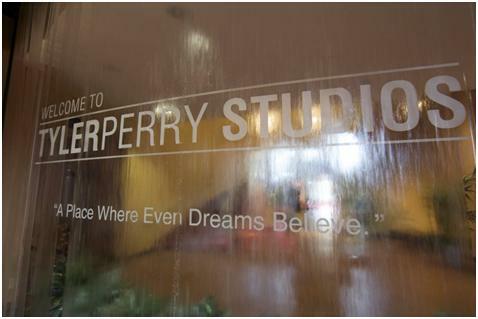 Atlanta — on May 1, 2012 Atlanta Fire and rescue responded to a “four-alarm” fire at Tyler Perry Studios. Shortly before 9:00 pm firemen were called to aid in putting out a blazing fire at one of Atlanta most well know entertainment studios. Tyler Perry Studios is located in SW Atlanta in the Greenbriar Mall, both Greenbrair Parkway and Stone Hogan road were closed down to through traffic as Firefighters worked to put out the blaze. “One building on the Tyler Perry Studio lot has, partially, collapsed due to fire damage,” according to Captain Jolyon Bundrige of the Atlanta Fire Department. No injuries have been reported yet and the cause of the fire has not been identified. Firefighters are currently on the scene. This story is still developing. love you tyler. it will be okay. i hope this does not stop Madea from making movies. Gloria - a "Georgia Peach"
I will share this with my friends. Praying for Tyler and Madea too, sounds like the next movie will be Madea Goes to Fire Academy…. I would go see that too. 🙂 but on the real, i hope everyone was okay. Do yall know if any other were buildings on fire or messed up? This is terrible. I hope everyone is okay. We are praying for Tyler Perry. Another great site about this product you can find over here sexdating!!! Let me know what you think about this site and i’ll subscribe to your blog! Woah this weblog is great i really like studying your posts. Stay up the great paintings! You already know, lots of people are hunting round for this info, you could help them greatly. Thanks for every other informative site. Where else could I am getting that type of information written in such a perfect approach? I’ve a mission that I’m just now operating on, and I have been on the glance out for such information. I’m now not sure the place you’re getting your information, but great topic. I needs to spend some time learning more or working out more. Thank you for wonderful info I was on the lookout for this info for my mission. Hi, Neat post. There is a problem together with your website in web explorer, might check this? IE still is the market leader and a large section of folks will leave out your wonderful writing due to this problem. I have learn some good stuff here. Certainly price bookmarking for revisiting. I wonder how much attempt you set to make one of these magnificent informative website. Hi there, I found your web site by means of Google at the same time as looking for a comparable matter, your website got here up, it appears great. I have bookmarked to my favourites|added to my bookmarks. Hi there, just turned into aware of your weblog via Google, and found that it is truly informative. I’m gonna be careful for brussels. I will appreciate for those who proceed this in future. Numerous other folks will probably be benefited out of your writing. Cheers! I don’t even understand how I stopped up right here, but I assumed this post was great. I don’t recognize who you’re but definitely you are going to a well-known blogger should you are not already. Cheers! Thank you for the good writeup. It actually was once a entertainment account it. Glance complicated to far brought agreeable from you! However, how could we keep in touch? Hi there, You have performed a great job. I will certainly digg it and in my view suggest to my friends. I am confident they will be benefited from this site. Another great site about this niche you can find over here sexdate!!! Let me know what you think about this blog and i’ll subscribe to your blog! I simply want to tell you that I am just very new to blogging and truly enjoyed your blog site. Most likely I’m planning to bookmark your blog post . You definitely come with outstanding articles and reviews. Thanks for sharing with us your webpage. Thank you for every other informative site. The place else could I get that kind of info written in such a perfect means? I have a challenge that I am simply now working on, and I’ve been on the look out for such information. Thanks lots for the article post.Actually thank you! Awesome.